Physical therapy exists to help Individuals and athletes address injuries and pain. On your first visit, you will be evaluated and delivered a protocol for your specific needs. Healing involves improving both mobility and flexibility. Your Totowa NJ physical therapist will take time to get to know you and your body in order to get you feeling strong and capable once again! What Should You Wear To Physical Therapy? Wear comfortable clothing that you can move in. You may not be working up a big sweat but you will be moving your body. If you have a knee injury you may want to wear shorts or loose sweat pants that can be lifted above your knee so that your Passaic County physical therapist can assess the movement of the joint or area in question. What Will Happen On Your First Physical Therapy Session? Your first visit will involve an evaluation and assessment of your condition. Whether you have had surgery, have a specific disease, or are simply in pain, your physical therapist will learn about you, your situation, and evaluate the area in question. This includes watching how you move and determining what will help you move better. Posture, strength, flexibility, and motion are examined and areas of improvement will be determined. Physical Therapy Is More Than Just One Session, Right? Your physical therapist will create a treatment plan and schedule more appointments to get you back on track. Plan on improving your strength, increasing your range of motion, and becoming more flexible among other things. Physical therapy is not a one size fits all fix but rather a plan tailored to each individual’s needs. Contact our team at Elite Spine & Sports Care of Totowa today to schedule your first NJ physical therapy session. We welcome the opportunity to answer all of your questions while getting you on the road to recovery. 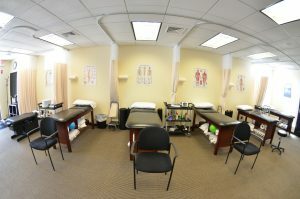 We will help you understand what to expect during your first physical therapy session. Our knowledge and experience will get you back in action and feeling strong!